We have really been enjoying the look of our breakfast nook. I still wish we had an extra 3 feet around the table, but there's not much I can do about that at this point! 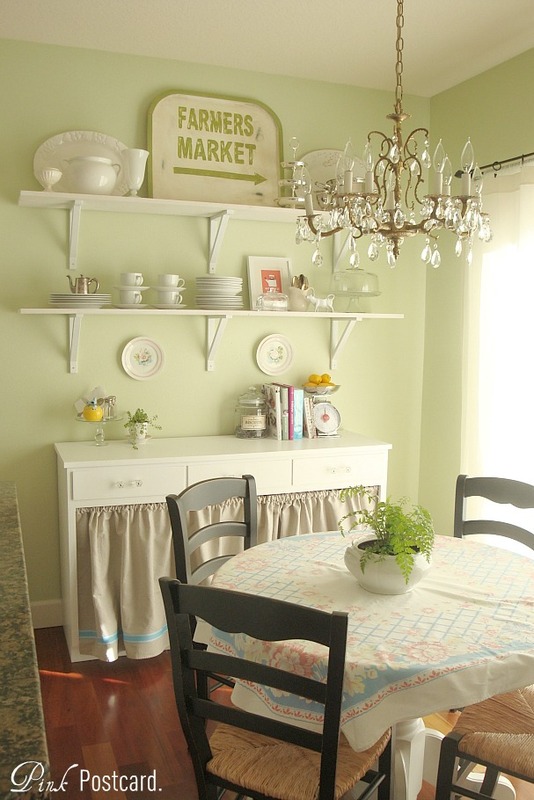 Anyway, last summer I showed you the little makeover I did on this "buffet" we added to our nook. It really wasn't a buffet- it was an old office cabinet. But, I loved the potential, and at $25, who could pass that up? Initially we decided (when I say we, I mean "me"...) to keep the bottom portion open. Now that we've lived with it for a bit, we (and I do mean "we") realized that from an aesthetic standpoint and a cleanliness standpoint, that it needs to be covered. We have a pug. If you have a pug, or have been around them, you know the sniffing / snorting, and the amount of hair they shed. I really don't want to be eating off of stuff that's at her level. Know what I'm sayin? I got a long length of drop cloth from Home Depot. Since most of it comes hemmed, I just sewed a rod pocket at the top edge. The ribbon was applied with iron on Stitch Witchery, so no sew there. I still wanted a bit of color with the new skirt, and I love the striped ribbon detail! One of my Pinterest pins gave me the idea for this project. You can click here to see the board. 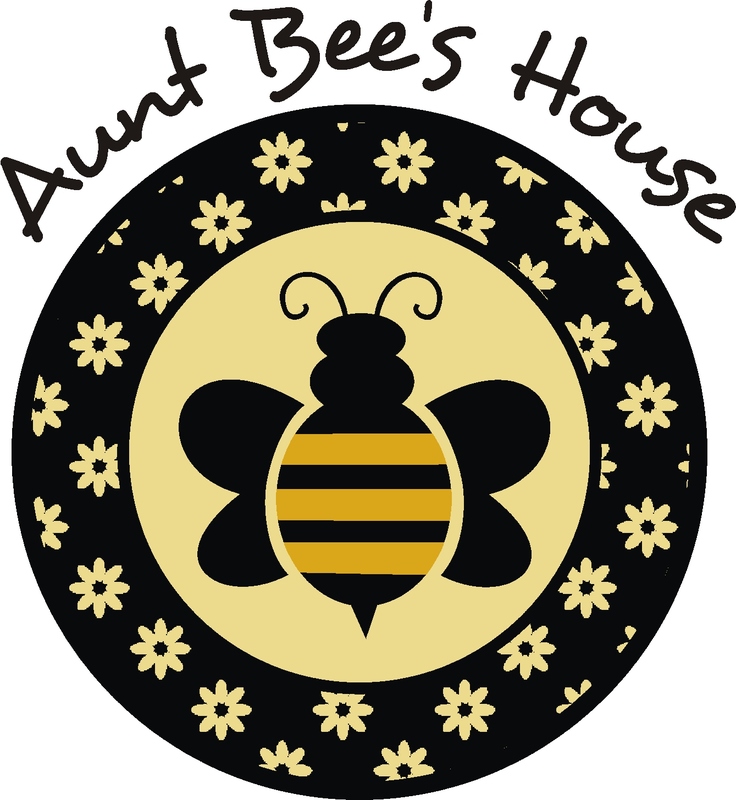 If you'd like to see the 'before' of our nook, click here. I like the softness this adds to our buffet, and the needed cover. On a different note, I just wanted to share a personal bit. Today is the 5th anniversary of bringing our beloved Bella home. Her "gotcha" day, if you will. Here was one of the first pics we have of her, when we were in our last house. Pug puppies are the cutest! So even though we keep Swiffer in business and endure snorts, she has brought so much joy to our lives from the moment she entered it. A skirt for the nook, and loves for the pup. 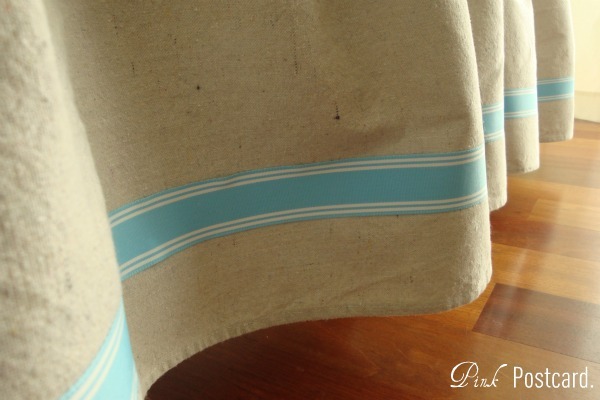 I love the ribbon detail on your buffet skirt! You buffet skirt looks great.. The whole room is so pretty and relaxing. Love it. cute skirt and cute pup-pup! I love their snorts!! I would consider that a perk! your dining room is so pretty! love the little skirt you made, it's perfect:) and your pug is so adorable, I agree they are the cutest puppies ever! Pug Puppies are the cutest. My Abby pug turns 8 next month. Your breakfast nook looks so cute and cottagey. Love it! Happy "gotcha" day Bella!! 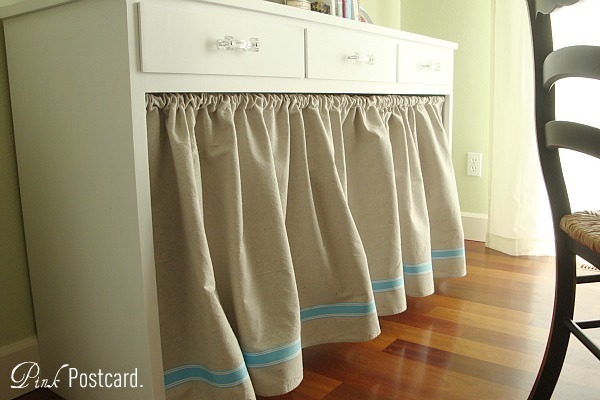 Your buffet skirt is adorable and a clever solution! And that little pug looks pretty kissable, snorts, shedding hair and all! The skirt looks great! I love the ribbon detail -- such a sweet little touch. And your fur baby is just precious! Pugs are my most favorite type of dogs! :-) Thanks for sharing! Denise, your nook looks amazing! i love the color you have in there and the new cabinet skirt is so cute. i feel like i am the only person who cannot find dropcloths at Home Depot that DO NOT have the plastic on the back of the fabric! must ask for help next time i am there. 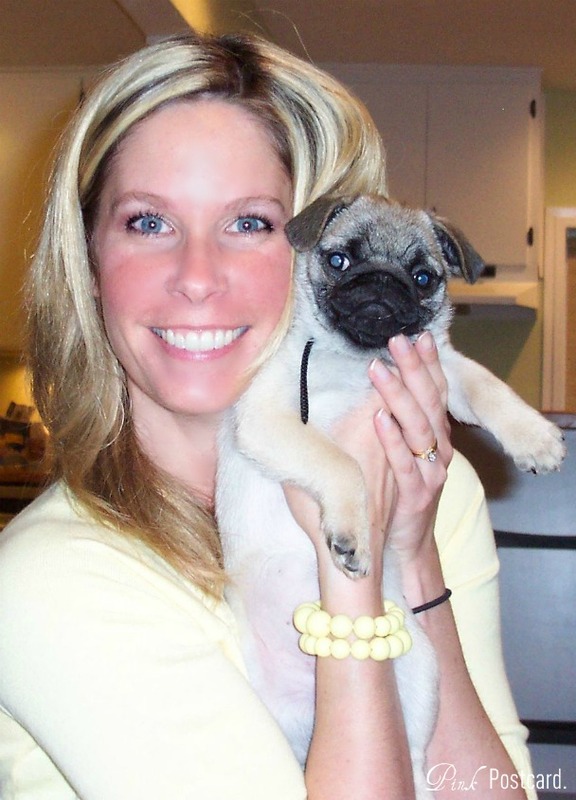 what a cute pic of you and your pup - love it! what a pretty breakfast nook! !what color/brand paint did you use? Love it. Your sweet doggy is adorable. Has blue eyes like you!! So happy to discover your blog. Our furry baby is the only one that gets shown on my blog too - I completely agree with you! What a pretty little nook, and cute little pup! Very pretty....the skirt and the pug! We have an 12 year old pug that we love so much too! so beautiful! we have a golden retriever puppy... 5 months and sweet and fill of energy. your pug is a cutie pie!